Francis and his companions were making a trip through the Spoleto Valley in Italy when suddenly, Francis spotted a great number of birds of all varieties. There were doves, crows and all sorts of birds. Swept up in the moment, Francis left his friends in the road and ran after the birds, who patiently waited for him. He greeted them in his usual way, expecting them to scurry off into the air as he spoke. But they didn’t. One day a brother brought a rabbit who had been caught in a trap to St. Francis. Francis advised the rabbit to be more alert in the future, then released the rabbit from the trap and set it on the ground to go its way. But the rabbit hopped back up onto Francis’ lap, desiring to be close to him. Francis took the rabbit a few steps into the woods and set it down. But it followed Francis back to his seat and hopped on his lap again! Finally Francis asked one of his fellow friars to take the rabbit far into the woods and let it go. That worked. This type of thing happened repeatedly to Francis and he spoke to animals wherever he went. Fish were also known to listen to Francis. Whenever a fish was caught and Francis was nearby, he would return the fish to the water, warning it to be careful and not to be caught again. On several occasions the fish would linger awhile near the boat, listening to Francis talk, until he gave them permission to leave. Then they would swim off. 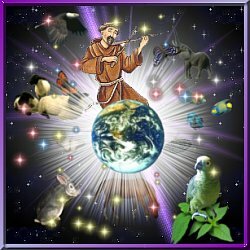 In every work of art, as St. Francis called all creation, he would praise the Creator.